For Windows 8 and later apply the fullscreen fixes. SecuROM and SVK Protector DRM disc check. The Gold Edition is a complete edition which includes the Night of the Raven expansion. Included with the Gold Edition. Not available separately for some languages (e.g. English). The latest retail patches for the German version are Patch v1.30 for the base Gothic II and Add-on Patch 2.6 for the Night of the Raven expansion. All English versions and German digital distribution versions already include the latest patches. A fan-made patch, which fixes compatibility issues and adds features. Instructions and download links available here. Requires PlayerKit 2.8, which the instructions include as a separate installer. A fan-made renderer which adds a wide variety of additional DX11 graphical features, such as hardware tessellation, full dynamic lighting, HBAO+, and more. Can also noticeably improve performance on modern systems, as it replaces the CPU-intensive view culling code. Instructions and downloads available here. Recommended to be used in combination with the System Pack. For Windows 8 and later use the fullscreen fixes. 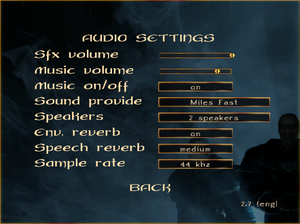 Gothic II only natively supports 1280x720, 1280x768, 1280x800, and 1440x900. The Gothic ½ — SystemPack makes the game Hor+ instead of Vert- and lists most widescreen resolutions. Characters may look fat/thin after changing the resolution. Save and load the game to correct this. Set zVidResFullscreenX= and zVidResFullscreenY= to the width (X) and height (Y) of your resolution. Save your changes and launch Gothic II. NPCs may look fat in widescreen resolutions. Talking to an NPC will fix this until the next time you load a save. Task-switching may cause repeated Tab ↹ input when you return to the game (simply press Tab ↹ again to make it work normally). Task-switching during video cutscenes will crash the game (there are only a few of these). 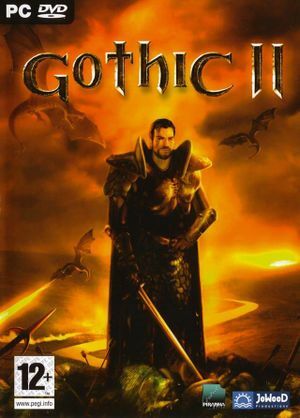 Install the Gothic and Gothic II fullscreen fixes. Set zStartupWindowed=1 in <path-to-game>\system\Gothic.ini (see Windowed). Set your desktop resolution in-game. Gothic II should now display as a fullscreen borderless window. Change zTexAnisotropicFiltering=0 to zTexAnisotropicFiltering=1 and save your changes. This is only an on/off setting; if it doesn't work or you want a higher setting, force it in the graphics card control panel. Change zVidEnableAntiAliasing=0 to zVidEnableAntiAliasing=1 and save your changes. Forcing a higher setting in the graphics card's control panel may cause black videos (sound but no picture). Set in Options, Game Settings, Invert camera. Limited native support; see Controller support. Can't map camera controls or axes. Change zMouseRotationScale to your desired value and save your changes. Change enableJoystick=0 to enableJoystick=1 and save your changes. Some axes are not be detected and some inputs cannot be set to controller axes, e.g. camera controls. Enabled by default; set in Options, Game Settings. Set sound provide to Creative EAX 2. Hardware accelerated DirectSound3D and EAX2 (on compatible sound cards with restoration software like ALchemy or 3D SoundBack) isn't available until the fix is applied. Available on Steam, despite not being stated in a store. Use Gothic Multiplayer mod for multiplayer (requires the expansion). gmp:// URLs do not connect to IP addresses. See Helix Mod: Gothic 2 [DX11]. This is caused by forcing anti-aliasing in the video card control panel. 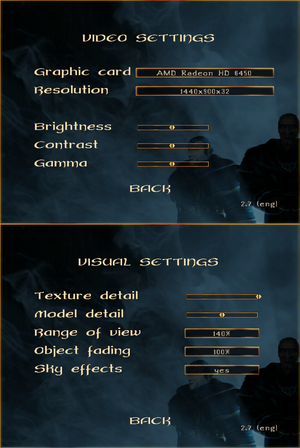 Both Gothic and Gothic II will now enter display correctly in fullscreen mode (you do not need to restart your computer). Gothic II has frame rate issues in fullscreen mode on Windows 8 and later. Gothic II should now have the correct frame rate in fullscreen mode. This error happens if Gothic II isn't able to automatically change to 32-bit color mode. Save your changes and run Gothic II again. It should now be able to select the resolution correctly. If it still can't detect your resolution, try setting it manually (see Widescreen resolution). Find and remove the GOG.com Gothic 2 entry. If you are using Windows 8 or later, install the Gothic and Gothic II fullscreen fixes. Gothic II will now allow you to task switch at any time. Some mods expect the game executable to be called Gothic2.exe. Make a copy of Gothic.exe. Rename the copy to Gothic2.exe. The mod installer should now see the game correctly. Some mods require running the game with Gothic2.exe. Gothic II doesn't see dsound.dll wrapper from EAX restoration software. Launch game as Administrator, change sound provider to Creative EAX 2 and quit. Launch game again and check if sound provider is still the same. 8.1, 11 DirectX 11 requires fan-made renderer. 1, 5 Shader Model 5 requires fan-made renderer. ↑ 2.0 2.1 File/folder structure within this directory reflects the path(s) listed for Windows and/or Steam game data (use Wine regedit to access Windows registry paths). Games with Steam Cloud support may store data in ~/.steam/steam/userdata/<user-id>/39510/ in addition to or instead of this directory. The app ID (39510) may differ in some cases. Treat backslashes as forward slashes. See the glossary page for details.